Please refer to an old thread on Planet figure HERE where I made a tricorn hat for a 1/16 head. 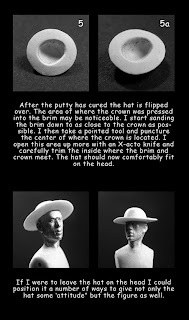 The somewhat different approach gives you another option for making a hat. I'll now move onto the moccasins and shirt. I love the way you are doing this Gary. The pictures are very useful and if saved will make a very fine tutorial, article for future reference.